Tired of painting your old lures? Well, guess what? I’ve got news for you! We all know how much of a hassle pimping a lure can be. However, there’s an easy solution. Let me introduce you to Polar Bait Lure Stickers. They are basically a replacement for your old lure paints. With the stickers, you can easily add realism to your lures. We all know how satisfying it is to make awesome looking lures. But, the paint wrinkles, chips, peels, and cracks after few weeks of fishing. These basically results in wasted time, effort and money. Moreover, buying various colors, spending a long time to use them on the lures is time-killing. So, I was looking for other options. And, the very first thing that got my attention was Polar Bait Lure Stickers. The Grounders is a kind of lure stickers with metal colors and this shines really well under sunlight. You can use only this sticker on your lure or if you want, you can use a naturalist’s sticker on it to create more realism. The colors are silver, gold, and white tinted on black and some more. This category is my most favorite one. Big fishes love these a lot. The Naturalists are a real copy of fish skins. These Stickers are somewhat transparent, so the lure’s own color is shown underneath. But if you use the Grounders Lure sticker underneath this, you can create a solid appearance. These are the most attractive and colorful of them all. And works pretty well as well. In case of rusty old lures, these stickers can cover it up. And the colors are very stimulating which can easily catch the attention of fishes. The designs are nice, geometric patterns mixed with dots with various sizes makes this category work very well. Dandies are like newbies but there is a metallic tint on them. And they shine really well. There is color variation just like newbies – yellow-black, red-white-black, blue-yellow and more. Because of the metallic color, they shine maximum sunlight. Thus, fails to miss the fishes eyes. This category has been created by fishing guide Ari Paataja, who has over 50 years of fishing experience from all over the world. It is one of the most professional stickers by Polar Bait. As the name says – this category of stickers looks just like a real fish skin. 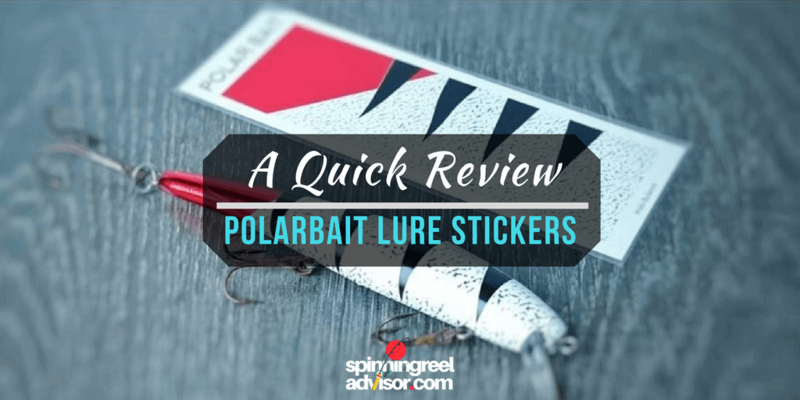 So, are you ready to add new life to your old lures with Polar Bait Stickers? Look no further. They are very cheap (Starting from only 0,80 €) and easy to fit in various tricky forms, look very realistic and last long. The stickers have very strong adhesive, so you don’t need to worry about them getting off your lures. So, being an angler, this would be one of the best choices for your fishing gears. How to Use Spoons to Catch Early Season Trout? SpinningReelAdvisor.com is a participant in the Amazon Services LLC Associates Program, an affiliate advertising program designed to provide a means for website owners to earn advertising fees by advertising and linking to Amazon(.com, .co.uk, .ca etc) and any other website that may be affiliated with Amazon Service LLC Associates Program.